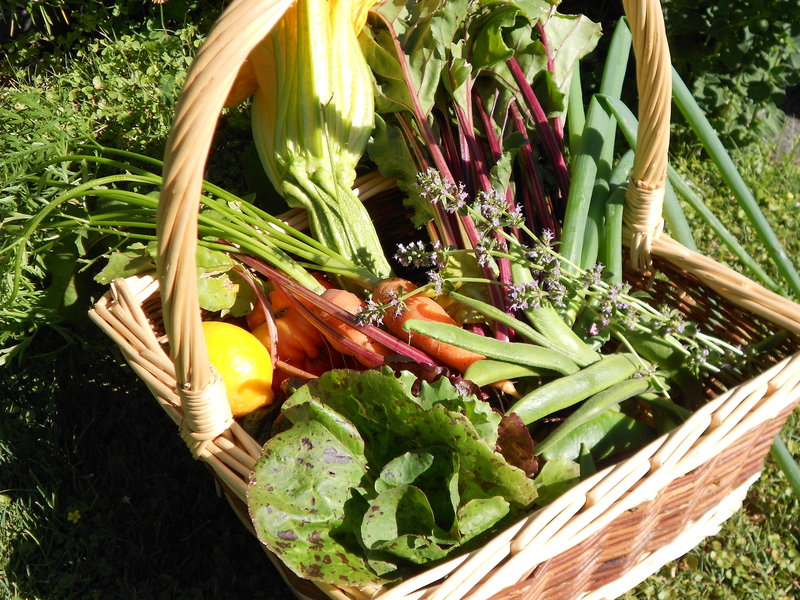 This month has been busy harvesting foods from the garden and making jams and preserves from local fruit. We have been picking our runner beans regularly throughout the month and started picking our tomatoes the last week of the month. The tomatoes are from a packet of heirloom tomato seeds that I planted, so it has been fun to see what they turn out like, with the tomatoes evolving into an interesting variety of shapes and sizes. I have continued to plant beetroot, carrots and spring onions for an ongoing supply into the autumn. I had a go at making blueberry jam but it was a bit of a flop as it didn’t set properly. Apparently blueberry jam is tricky to get right. However, it will no doubt get eaten as toppings for desserts etc. One of my favourite fruits, Black Doris plums, came into season at the end of the month. We found an organic orchard that sell them, not far from where we live, and bought loads to make jams and preserves. 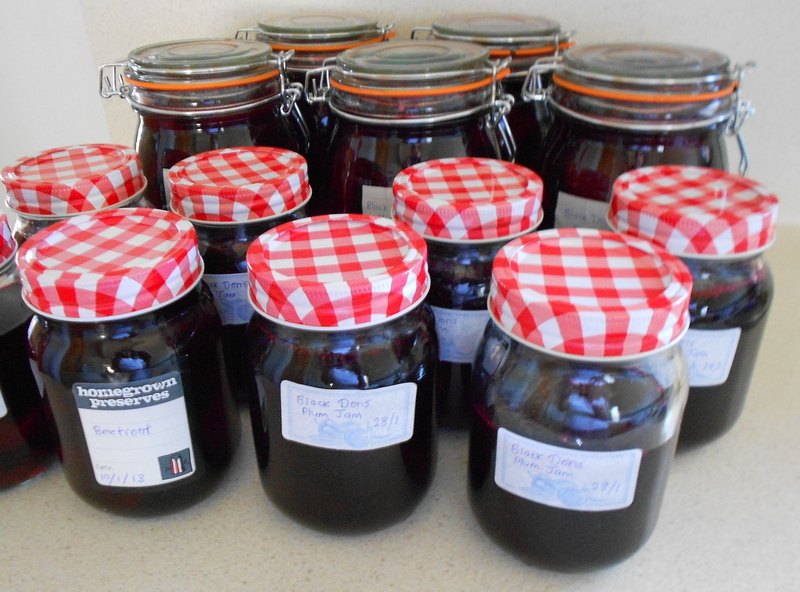 The Black Doris jam was a success, and there are plenty of plums left over to make desserts as well as stewed plums to have with our breakfast cereal. I have continued to make zucchini slices and loaves for the freezer. The one zucchini plant has been providing us with an ongoing supply. I also bottled nectarines and beetroot. This is the first year we have grown our own beetroot and we have been enjoying it roasted and with salads. It’s great that it is so easy to grow, as beetroot is highly nutritious, high in vitamins, minerals and anti-oxidants, and good for the heart. My new favourite cake is Red Velvet Beetroot cake. There are many variations on Red Velvet Cake, some using red food colouring and some using beetroot. 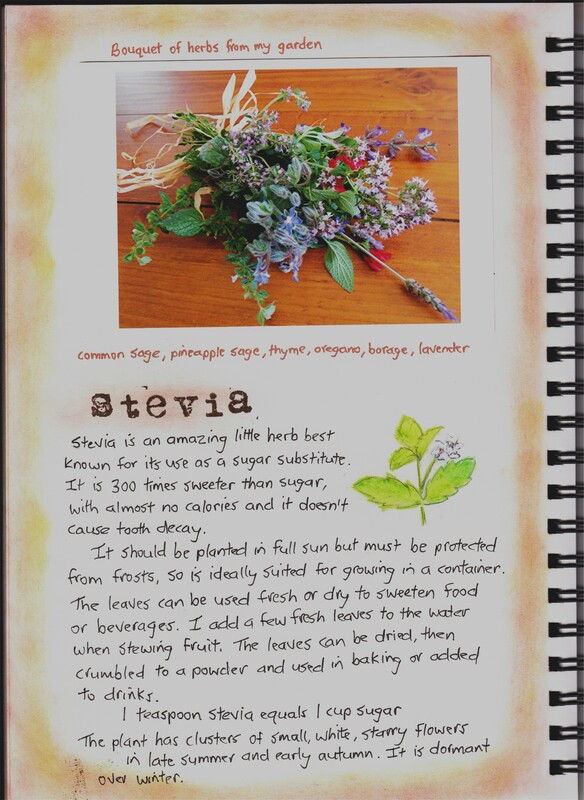 I have adapted the recipes to make my own version – see below. 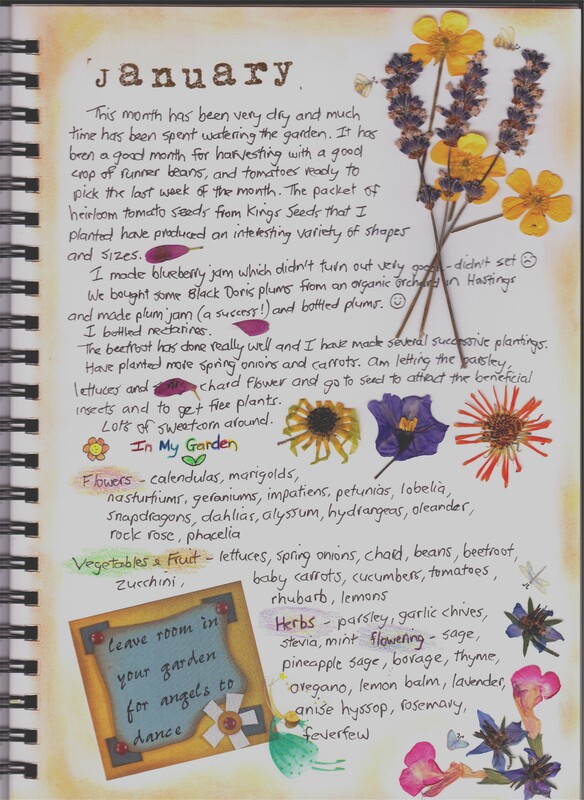 There are lots of herbs flowering in our garden at the moment. The blue and purple flowers are very pretty and are good for encouraging bees to the vegetable garden. This is a moist cake. If it is a little gooey in the middle, don’t worry, it will be all the more delicious! Beat together eggs and sugar. Mix in vanilla, oil and beetroot until well combined. Add sifted flours, baking powder and cocoa to mixture and mix well. Pour batter into cake tin. Bake for 45 minutes. Cool and spread with chocolate vanilla cream cheese icing. Beat cream cheese and butter together. Add vanilla. 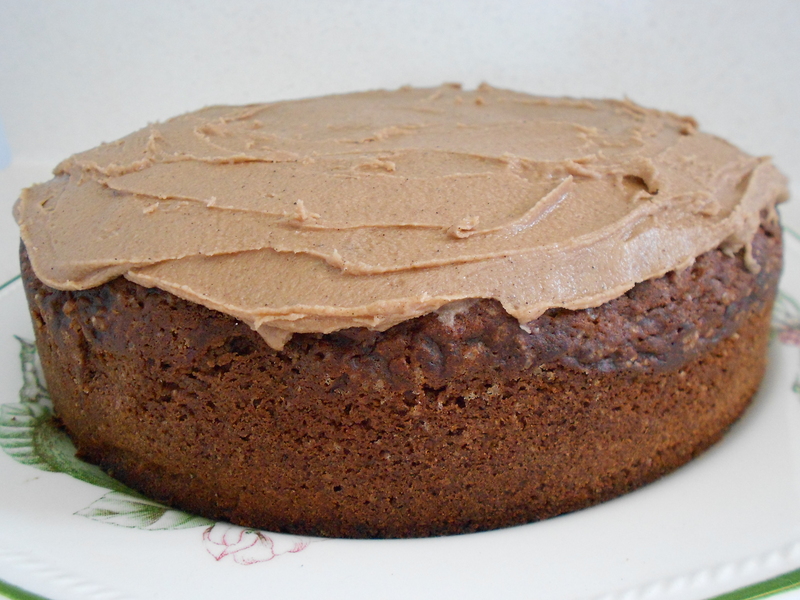 Sift in cocoa powder and icing sugar and mix until smooth and creamy. 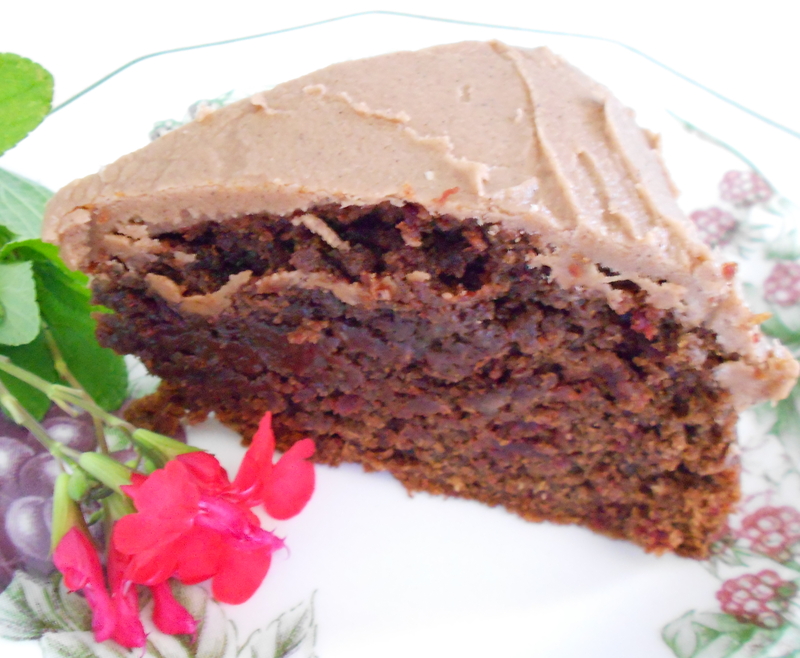 This entry was posted in Garden Journal, My Blog, Recipes and tagged chocolate vanilla cream cheese icing, garden in January, garden journal, red velvet beetroot cake, stevia. Bookmark the permalink. A great looking harvest and yummy cake!! Wish I had a slice right now! Thanks Bernice. I was really pleased with how the cake turned out!